Welcome to the ninth edition of our weekly curated news article where we provide you with the widest possible overview of the most important events that have transpired in cryptocurrency and blockchain developments. We’ve made sure to analyze all of the news reports available on the internet and reviewed them for relevancy. 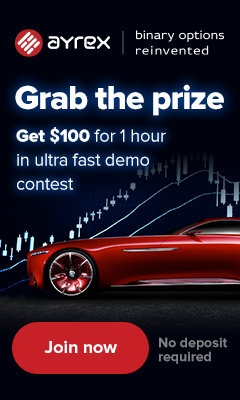 This article is best suited for weekly and swing traders as well as individuals with a packed schedule that want to satisfy their interest in cryptocurrency and blockchain with a minimal time investment. Square releases earnings from 2019, and the results are surprising. Demand for blockchain engineers has sky-rocketed. Malta is standing on glass legs, as legal promises are difficult to uphold. First ever regulated Swiss bank coin, and it’s a standard ERC20 Ethereum token. QuadrigaCX may have been an exit scam after all. Ham Radio-powered Bitcoin transactions are proven to be possible. Starbuck will serve coffee in exchange for Bitcoin, after getting a sweet deal in Bakkt equity. 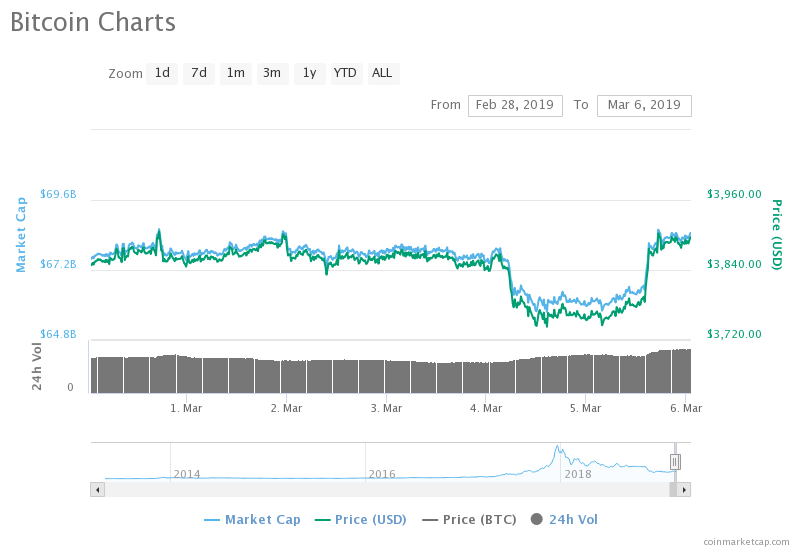 Bitcoin’s price has been relatively stable for the majority of the week, apart from the 24 hours between the middle of 4th of March and the middle of the 6th of March. The price dip correlates a few important stories, one the QuadrigaCX’s auditors finding the empty cold storage wallets, and the announcement that Starbucks will accept Bitcoin, after signing a deal with Bakkt. The results seems to have brought back the price of Bitcoin to pre-dip values. Since then it has shown a little bit of growth, potentially seeking to test the $4000 ceiling once more. The public’s eye has a tendency to create stories that are appealing to the most basic of human traits. Greed, Desire and Familiarity among other traits are most often used to attract attention and clicks to websites. That was the story behind the “Crypto Winter”. It simply made good, clickable headlines. The reports however, show a different story. While Bitcoin is struggling with price volatility, the demand for the asset is quite significant. One payment processor, Square released its earnings report for 2018 and in it we can observe that they’ve made a profit of $1.7M just by supplying their customers with Bitcoin. $166M worth of crypto passed through the processor, and into investor’s hands. It added to the company’s bottom line, and provided the organization with additional financial padding. While for some it may have been winter, and indeed a lot of people lost money in the BTC hype, for others it has provided an immense opportunity for growth. Rarely do we have an opportunity to observe such a beautiful presentation, as the one created by the team at Hired.com. They’ve analyzed the job markets in software engineering, and have discovered a staggering increase in the demand for blockchain experts. It uncovered many other facts about software engineering that you may or may not be interested, but the fact of the matter is clear. Blockchain is becoming increasingly relevant, and the number of companies looking for qualified developers in on the rise. During the hype Q1 last year, we observed similar tendencies. However a few fundamental misconceptions were at play. Companies haven’t really invested a lot of time into researching blockchain, nor were they able to fully comprehend the “complex” simplicity of cryptocurrency (at least Bitcoin). They were mostly driven to seek software engineers out of fear that their competition will get the leg up in the race. Of course, they are still competing, but we believe that this year, it’s a little bit different. Companies show more insight and understanding of what it takes to be a blockchain developer, and what kind of incentives they should offer to these individuals. Blockchain Island, or at least we thought so. Latest reports showcase a specific unwillingness in Maltese banks to provide their services to cryptocurrency businesses. For many of them, cryptocurrency and blockchain are too risky, reports The Times of Malta. The core of the issue is two-fold, one in the slowness of the MFSA licensing which are demanded by Maltese banks in order to consider a positive answer. The second part is the knowledge of the systems by the banks and their executives, as they’ve demonstrated no clear knowledge to differentiate between cryptocurrency and blockchain knowledge. Silvio Schembri, the Parliamentary Secretary for Financial Services said that he is aware of the fact that banks do not accept crypto companies, while others have made accounts for blockchain entities. As a result he is making efforts to discuss with the banks and educate them on the similarities and differences between cryptocurrency and blockchain. The good news is that the Maltese Financial Authorities are expecting to come up with the first decisions on licensing questions by the end of the first quarter, hopefully later this month. The bad news is that 28 crypto and blockchain license requests are currently waiting in the queue, painfully separated from banking services they need to perform their own operations. The due-diligence process is long, and that’s with a good reason, but the worrisome part is that Malta has been dubbed as a “Blockchain Island”, without the legislative and governmental reform such a title requires. Bitstock’s CEO crashes a purple Lamborghini in the U.K.
Twitter scam bots are back, be careful! When JP Morgan Chase announced their cryptocurrency/blockchain project to the world, it set of a chain of events that is now coming to fruition. Swiss bank Dukascopy has successfully launched their own token, the Dukascoin. 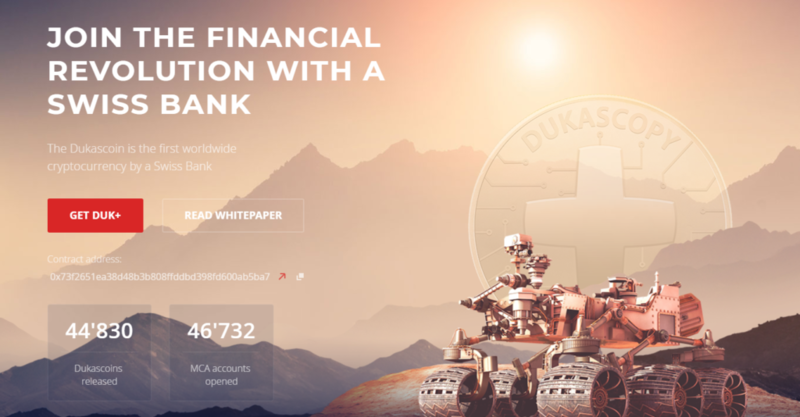 Unlike JPM Coin however, the Dukascoin is a standard ERC-20 token, and it is available for use both in and out of the bank. As far as we are aware this is the first time a certified bank has issued a coin in this way, and as the bank has detailed in their whitepaper (yes, an actual whitepaper) it is 100% the first Swiss bank to issue a cryptocurrency. The bank is deploying the coin through an Airdrop ICO, which is distributing a total of 20 Dukascoin per signup. 5 coins go to the person signing up, 5 coins go to the Referrer of the person, and 10 coins go to the bank itself. The bank justifies taking this cut by appealing to the deposit reward program it has outlined in the whitepaper. I’ve created my account, and it is now pending verification. I’m looking forward to this new, but realistic banking experience. While JPM Coin is busy providing the same old services to corporate clients, Switzerland is taking yet another stride past the competition in blockchain space. In what has probably marked the start of 2019’s (hopefully not too long) chain of scandals, the story around QuadrigaCX continues to surprise. According to the court-appointed auditor, Ernst & Young Inc. the cold wallet storage that QuadrigaCX previously pointed towards as containing the missing cryptocurrency, have been proven to be actually empty. All of this is adding to the possibility that QuadrigaCX may have been an exit scam all along. The wallets themselves haven’t been used for storing customer deposits since April 2018, and as such no clear trail can be located that points to the missing funds, at least for now. This of course spells disaster for customers of the exchange, and with the founder supposedly having died in India, there is no clear actor to assume the responsibility of returning the missing property. All in all this adds more fuel and strength to the argument that cryptocurrency needs to rely more on decentralized, uncensorable exchanges, as opposed to the centralized, vulnerable exchange. Radio is most commonly associated with audio, and hasn’t anything to do with cryptocurrency and Bitcoin. But it actually can have, as proven by two developers working in the U.S. and Canada. Who wants to attempt a #LightningNetwork over #amateurradio on JS8? Will be 18 messages long! 40m band looks open. Rodolfo Novak and Elaine Ou, have managed to open an invoice and pay it supposedly all over Ham radio frequencies. It seems that Bitcoin can potentially be used even in a post-apocalyptic scenario, where most of modern infrastructure would be destroyed. Radio is not that difficult to construct, and may one day (hope not) become the main way that Bitcoin is transacted. Starbucks has gotten the deal of a lifetime! In exchange for activating Bitcoin payments, an action that would likely cost the franchise less than $200k USD to incorporate across all chains, they are to receive an equity stake in the publicly-acclaimed Bakkt exchange. Starbuck will of course not process the Bitcoin transactions themselves, as it would be a legal nightmare. They will utilize other third-party services to facilitate instant conversion to USD at the time of purchase. Having nothing to lose and everything to gain, Starbuck has been given a deal so sweet, that they couldn’t resist saying no. Sort of like coffee, so good that even if you had one too many in a day, there is always room for one more. That’s it for this week. As always, share your opinions about the most interesting ones or link those stories we might have missed in our collections, which you found interesting and noteworthy over the week. You can also send us suggestions of stories to include in the next list if you find something interesting over the next days. Featured Images via Pexels and Unsplash.